I'm English and was taught basketmaking by my father, who was taught by my grandfather... It goes back a long way. If you're interested, there's another page with a little more of our history. This video is of myself making a large bicycle basket in my workshop in Assen. 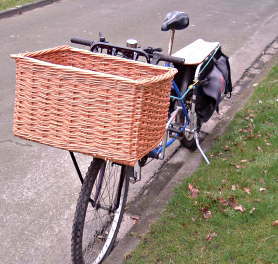 These photos show the basket made in the video fitted to a bicycle. This basket is an extra large size for a delivery bicycle that I use to take my baskets to the post office - from where they make their way to customers all over the world. 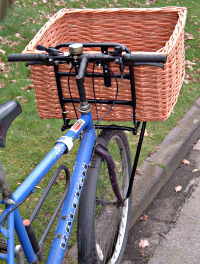 The basket is fitted on top of a front rack which I also sell. Take a look at other baskets I've made at the links below or contact me to discuss a basket made uniquely for you.